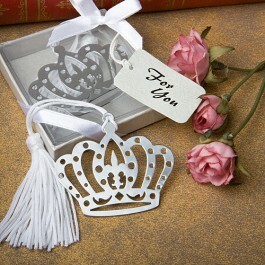 You don't have to be royalty to afford these crown design bookmarks! They will make wonderful guest favors for your special fairy tale, Victorian or gothic event. The cutout shiny silver metal crown charm with a central fleur di lis design and white satin tassel will make each guest feel like a king or queen. Minimum order of 12.